[Fig. 35(1)] The best way to see the magnificent cliffs, waterfalls, granite spires, domes, and meadows of Yosemite Valley is probably on a bicycle. A slow, easy ride around the 7-mile-long by 1-mile-wide valley would take no more than half a day. There are probably two dozen places where you could sit down for a picnic lunch and enjoy the view of your life. Bring the camera. But the valley comes with a warning: Crowds and competing interests are everywhere. In this small valley, world-famous rock climbers congregate at Sunnyside Campground near Yosemite Lodge before they ascend El Capitan. Backpackers begin the 223-mile John Muir Trail at Happy Isles on the east end of the valley. Day hikers crowd trails that climb to the valley rim. People rent and ride horses not far from Mirror Lake. Open-air trams, tour buses, and cars jam the roads. On any given weekend, researchers have found the traffic is comparable to downtown Houston rush hour. Restaurants, motels, retail outlets, a U.S. post office, and a federal magistrate with his own courthouse and jailhouse can be found in this outdoor paradise. The National Park Service has been working on a restoration plan to move campgrounds, buildings, and other developments away from the floodplain of the Merced River. The river's 1997 flood was the biggest on record this century in the valley. It closed the park for more than two months. Federal officials received almost $200 million to rebuild damaged buildings, roads, and sewage systems. 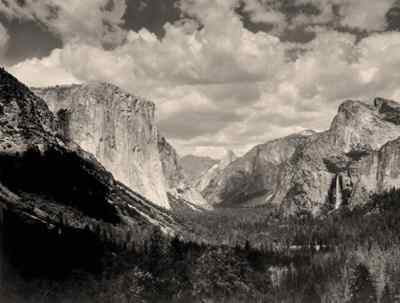 But the work is mired in lawsuits and delays, which have characterized planning efforts since 1980 in Yosemite Valley. Each summer, the crowds return. In the midst of this traffic and work, nature continues. Raccoons (Procyon lotor) are sometimes found under soda machines waiting for people to drop food. Mountain coyotes (Canis latrans) are seen trotting along lines of cars stopped in front of El Capitan. Usually, somebody will throw the critters something to eat. Mountain lions (Felis concolor) are rarely seen around Yosemite Valley, though scientists say there are more of them around the valley now. They do not normally attack people, but park officials warn people not to allow their children to stray without an adult nearby. Mountain lions, which are marvelous stealth hunters, prefer to strike prey that is smaller and represents an easier kill. The lions prefer to feast on mule deer (Odocoileus hemionus), which are also seen walking through meadows and crossing trails in the valley. Campers sometimes wake up in the morning with a doe browsing through nearby vegetation. The Miwok tribes also ate from the natural food around the valley, including mushrooms, berries, bulbs, insects, and some 40 different plants. Some of the bulbs they ate were soap roots (Camassia pomeridianum) and corn lily (Veratrum californiacum). Berries included greenleaf manzanita (Arctostaphylos patula) berries, white-leaf manzanita (Arctostphylos viscida) berries, gooseberries (Ribes amarum), currants (Ribes roezelli), wild strawberries (Fragaria vesca), and elderberries (Sambucus caerulea). Exotic species of plants and grasses are found throughout the valley, so don't be surprised to see the apple orchard on the east end where bears often go to feed. Park officials have begun meadow-burning projects to clear the land of invasive exotic species and allow natural grasslands to return in many places. If there seems to be smoke in the valley, look for signs noting "management burns" of meadows or upland areas that have become too densely crowded with vegetation. Such burns either allow native plants more room to grow or they eliminate excess brush that would only fuel a much larger fire and endanger large trees. In general, avoid Yosemite Valley on Memorial Day, the Fourth of July, and Labor Day weekends. If possible, schedule the vacation in April when the waterfalls are usually thundering during the spring thaw. But if you visit in April, remember the high country trails are most likely still under snow. If you're driving around the valley and you've seen all the waterfalls, stop at El Capitan Meadow on the valley loop road, pull out the binoculars, and watch the rock climbers scaling El Capitan. It is considered one of the best climbing spots in the world. Directions: Yosemite can be entered from Highway 41 from the south and Highway 140 from the west. Highway 120 or Tioga Road intersects with Highway 140, bringing in visitors from the east and northwest. From the south, drive 94 miles from Fresno on Highway 41. Follow signs about 30 miles to the valley. From the west, drive 81 miles from Merced on Highway 140 through the Arch Rock Entrance Station, and follow the signs about 12 miles to the valley. Activities: Hiking, backpacking, camping, nature photography, horseback riding, ice skating, snowshoeing, bicycling, sight-seeing, and fishing. Fees: There is an entry fee. Facilities: Ahwahnee Hotel, Yosemite Lodge, Curry Village tent cabins, picnic areas, restaurants, grocery store, post office, fire station, campgrounds, retailers, rentals, ice rink, and stables. Closest town: El Portal, 14 miles. For more information: Yosemite National Park, PO Box 577, Yosemite, CA 95389. Phone (209) 372-0529. For recorded information on traffic, weather conditions, and camping or motel reservations, phone (209) 372-0200. [Fig. 35(2)] People hike this trail in a day, but it's a long day. Hikers are essentially walking up to the rim of the valley. Bring lots of water64 ounces or more. When the warm weather arrives, the streams dry up everywhere around this trail. A lot of people hike to the top of Yosemite Falls, which combines three separate falls into a vertical descent of 2,425 feet. America's tallest waterfall was created when glaciers turned V-shaped Yosemite Valley into a U-shaped valley, scraping away the gentler slope that Yosemite Creek traversed several million years ago. The creek became "suspended," bouncing off great ledges in the granite. The ledges were carved because of flaws in sections of granite. The upper section drops a breathtaking 1,430 feet, and its flume becomes an ice cone against the rock in winter. The middle fall plunges 675 feet, and the lower fall dives 320 feet. The trail to the top is dusty in summer, but it has rewarding views of Half Dome and Quarter Domes to the east. 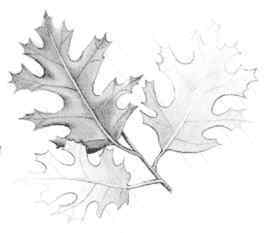 The first 0.5 mile of the hike is filled with steep switchbacks through talus fields and wondrous stands of black oak (Quercus kelloggii), which produce leaves in the spring from reddish leaf buds. Look closely and perhaps see a great horned owl (Bubo virginanus) nesting in some rotted-out crevice of an oak. The deep hooting of this owl can be heard at dawn, so get an early start. The pygmy owl (Glaucidium gnoma) may be a little easier to see because it is active all day long. After climbing for about 3.5 miles on this trail, hikers turn east to meet Eagle Peak Trail. Stay to the right and follow the trail down to Yosemite Creek. The water is snowmelt, so it is cold. Stay back away from the slick boulders and stay behind the railing at the fall. Continue on the trail over a bridge and climb for another 0.8 mile to Yosemite Point. The view includes snow-covered Clark Range to the southeast. This panoramic view has its price: You have to turn around go and back down the way you came. Directions: From the Wawona Tunnel on Highway 41, drive 8.3 miles to Yosemite Valley. Highway 41 becomes a loop road around the valley. Follow the signs to the west end of the valley and drive about 0.6 mile to Sunnyside walk-in campground. Park near Yosemite Lodge, across the street from Sunnyside. Walk through the Sunnyside parking lot to the marked trailhead. Elevation: About 2,600-foot gain, 6,600-foot peak. Surface: Well marked, but steep with switchbacks up a talus slope. [Fig. 35(3)] Views of El Capitan are stunning and close on this trail, though views of El Capitan are pretty remarkable from almost any angle. The trail is for people who don't want to gain a lot of elevation but who still want to see the high-elevation sights on foot. Bridalveil Fall and the spires of Cathedral Rocks are also easy to see up close on the trail. East valley sights include Half Dome. Most people need binoculars to see climbers on the big wall at El Capitan. It is about 3,500 feet to the valley rim, and climbers take many different many routes. El Capitan is a challenge known around the world. As hikers pass, they will notice a low ridge of rock in the nearby forest. The ridge is called the El Capitan Moraine, which was left when the last glacier departed Yosemite. The moraine helped to dam the old Lake Yosemite, which filled the valley thousands of years ago. Bridalveil Fall, which usually runs year-round, drops 620 feet with a wide spray that usually douses visitors who stand too close. Bridalveil is a classic example of what geologists call a hanging valley. It was a canyon intersecting with Yosemite Valley at one point 2 million years ago, but glaciers sliced away the place where the canyon and the valley met. So the canyon was left hanging above the valley and Bridalveil Creek became a waterfall instead of a stream flowing into the valley. The Ahwaneechee called Bridalveil Pohono, meaning puffing wind. Many in the tribe had a superstition about the place being evil, though no one knows precisely why. The Valley Loop Trail crosses the Merced River at Pohono Bridge. Hikers will notice the National Park Service is keeping people out of Bridalveil Meadow because it is restoring vegetation in the area. Follow the signs and stay on the trail. Directions: From the Wawona Tunnel on Highway 41, drive 8.3 miles to Yosemite Valley, and drive the Highway 41 loop about 2 miles past Yosemite Lodge. You pass Leidig Meadow and come to Devil's Elbow Picnic Area. The marked trail starts just west of the picnic area. Elevation: 150-foot gain, 4,125-foot peak. Surface: Open footpath, well marked. [Fig. 35(4)] Hikers can reach at least two magnificent waterfalls on this trail. If they are ambitiousmeaning, fit and ready to walk for 12 hours or sothey can also reach Yosemite's ubiquitous icon, Half Dome, by simply extending their hike from this trail. The views of the Merced River canyon and Tenaya Canyon are worth the extra wear on the legs. The trail at Happy Isles is also the starting point of the famed John Muir Trail, which goes about 220 miles south across the Sierra to Mount Whitney and down the east side of the Sierra. Do not entertain any thoughts of being alone in the wilderness here. This is easily the busiest trailhead in Yosemite. It is sometimes called a "freeway" by experienced backpackers. The first few miles of this walk are called the Mist Trail because of Vernal Fall, the 317-foot fall that hikers first encounter. In spring, when snowmelt swells the Merced River, the mist soaks everything, making the granite steps slippery. Take it slowly. Stay out of the seemingly placid pools above the fall. Many people have cooled off in the water and plunged to their deaths. Hikers will see flourishing black oak (Quercus kelloggii) and incense cedar (Libocedrus decurrens) along the way. The cedar may show signs of incense cedar dry-rot fungus (Polyporus amarus), which opens cavities in the wood. Woodpeckers will search for the larvae and leave little depressions in "shot-hole" patterns. Some hikers stop and turn around after 1.5 miles at the top of Vernal Fall. The hike has been enough for some people because of a strenuous 0.7-mile section with more than 500 steps carved in the granite alongside Vernal. Those continuing will go about 2.7 miles into the hike before reaching the bottom of Nevada Fall, the 619-foot fall that thunders above Vernal. Hike another 0.6 mile up to reach some nice picnic areas. Whether you're continuing to Half Dome or taking the right fork in the trail to hike down a section of the Muir Trail back to Happy Isles, fill up on water from the river. And use your water filter to purify it. Some people opt to hike another mile to Little Yosemite Valley and camp the night before assaulting Half Dome in the morning. You will need a wilderness permit from the National Park Service to camp. The free permits are available at the Wilderness Center in Yosemite Village. When camping at Little Yosemite Valley, remember some of the most active bears in Yosemite live right there. Nightly food raids have been going on for a long time, so use the bear boxes to store food, toothpaste, or even chewing gum. Anything that has a scent will attract them. Also, consider leaving all the pouches unzipped on your backpack. If squirrels get a whiff of any strong scent, they will chew a hole in your pack. With the pouches unzipped, they will simply search and leave. To ascend Half Dome, a set of parallel cables is drilled into the granite on the backside of the dome. Hikers must walk at various angles approaching 45 degrees or worse while holding onto the cables and pulling themselves up. If you are carrying lunch in a daypack, do not leave it anywhere. The yellow-bellied marmots (Marmota flaviventris) are fearless and inventive food thieves. They too will chew a hole in your pack to get at your food. One other Half Dome warning: If storm clouds are anywhere on the horizon, do not attempt climbing the cables. Thunderstorms appear very quickly above 8,000 feet in the Sierra, and lightning strikes are common on Half Dome. Once on top of Half Dome, hikers are often surprised to find it is quite large. The views include Glacier Point to the west, the massive Merced River canyon to the southeast, and the Tenaya Canyon high country to the north. Enjoy the view, but remember you still have more than 8 miles of hiking to get back down to your car. Directions: From the Wawona Tunnel on Highway 41, drive 8.3 miles to Yosemite Valley. Follow signs on Highway 41 to Curry Village on the east end of the valley. Park in the day-use parking lot. The trailhead is about a 1-mile walk southeast of the parking lot. Follow the signs. Trail: 6.6 miles round-trip to Nevada Fall, 17 miles round-trip to Half Dome. Elevation: 1,900-foot gain to Nevada Fall, 4,900-foot gain to Half Dome; 5,880-foot peak for Nevada Fall, 8,842-foot peak for Half Dome. Degree of difficulty: Strenuous for Nevada Fall, very strenuous for Half Dome. Surface: Granite stairway cut by federal work crews decades ago in the first few miles, some steep switchbacks on the way up to Half Dome.